Welcome to Syringa Cyclery in Sandpoint Idaho. Owner and bike builder Charles Mortensen offers custom bicycle builds and standard bike repair. Charles builds bikes spec’d to customers needs and desires. It’s not just about the bike, it’s about the ride and the experience. Looking for that new custom townie? hauler or long distance ride? or time to upgrade that mountain bike? Come in to the shop and let us help you get out there riding! Located conveniently in downtown Sandpoint. PLEASE BE ADVISED: Syringa Cyclery does not conduct online or mail order sales. 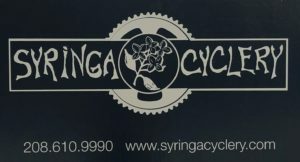 Any entity attempting online or mail order sales or services either directly or as a third-party seller on sites such as Amazon.com under the name Syringa Cyclery is likely doing so fraudulently and is not associated in any way with Syringa Cyclery.